Acme Weekly Flyer December 7 - December 13, 2018. Holiday Savings! 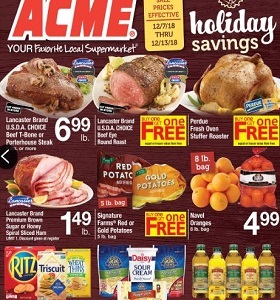 Acme Weekly Flyer December 7 – December 13, 2018. Holiday Savings! -$15.99 Campoverde Fruit; $3.49 New York Texas Toast.